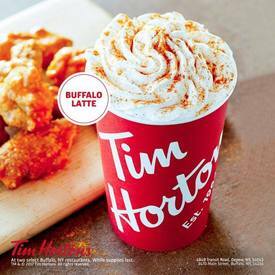 Tim horton's launches buffalo latte! While a plate of Buffalo wings with a latte on the side sounds strange in and of itself, they’re taking it a step further. According to the press release from the company, the drink is “made from freshly brewed espresso, steamed milk, mocha, and bold Buffalo sauce flavor.” To top it off, it has zesty Buffalo seasoning dusted all over it.